We visited on a Saturday 4:30pm performance and there was plenty of parking available. FREE parking is available in the Playhouse car park or there is paid for parking in the surrounding streets. I noticed a sign saying there was free parking in Whitley Bay across weekends in December on the parking meter so this is worth checking out (always double check in the area you've parked as you know what traffic wardens are like). Lots of buses serve the Playhouse (check here for details) and if you travel by Metro, you can travel for FREE 2 hours prior and 2 hours after any performance (just show your ticket to the inspector - see here for t&cs). 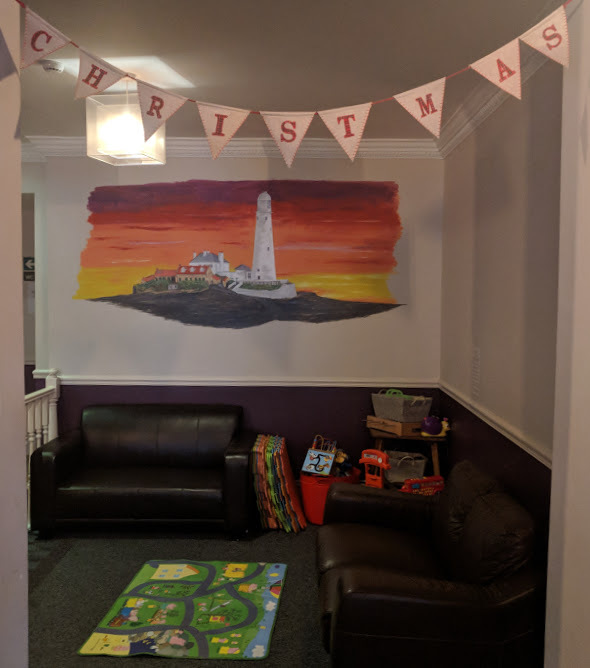 We dined at Evan's Bistro which is right by Whitley Bay Metro Station on Whitley Road and an easy 10 minute walk to the theatre. We love it here as their kids menu is just £4.95 for 2 courses and a drink and they have a fab toy area which keeps them entertained. Festive fayre is available for grown-ups throughout December at 2 courses for £14.75 (see menu here). 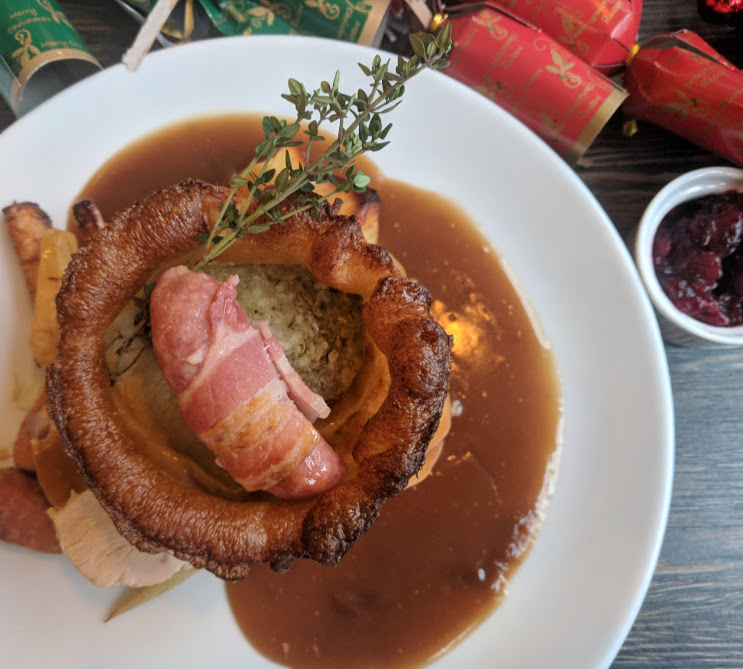 Other options in the area include Di Meos Pizzeria, the Crab and Waltzer, Pantrinis for Fish and Chips or the Waffle and Pancake House or Trenchers in Spanish City. I think the Playhouse Panto is a perfect one to bring little ones along to. It doesn't feel too long or drag on in length and the storytelling is great and is at the heart of the show. There's a nice mix of singing and dancing too which little ones love to get involved with. There is loads of audience participation including the now infamous Ghostbusters scene with *that* bench, lots of boo-ing, cheering and dancing along. Kids get up on stage (which is always the cutest part) and at the end of the night, the whole audience is up on their feet dancing. I swear the screams you'll hear here, are the loudest of any panto I've ever been to. 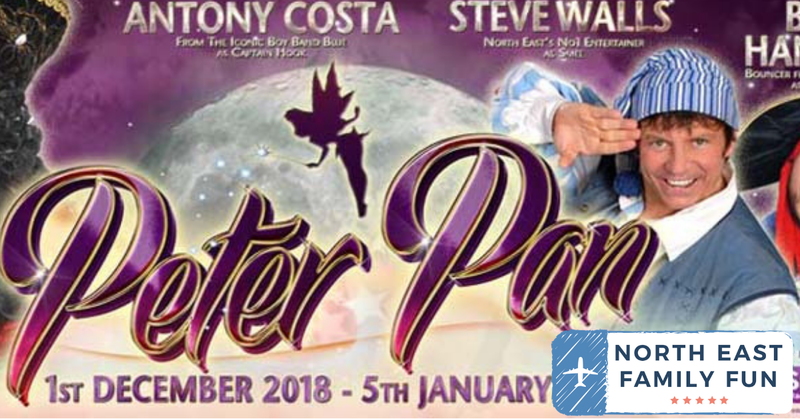 There does tend to be a younger audience at this panto so do expect a bit of noise around you and lots of people getting up for loo breaks etc.... for some reason, this always happens a lot at the pantos here but as a fellow parent, I don't mind too much. Something to be aware of though. 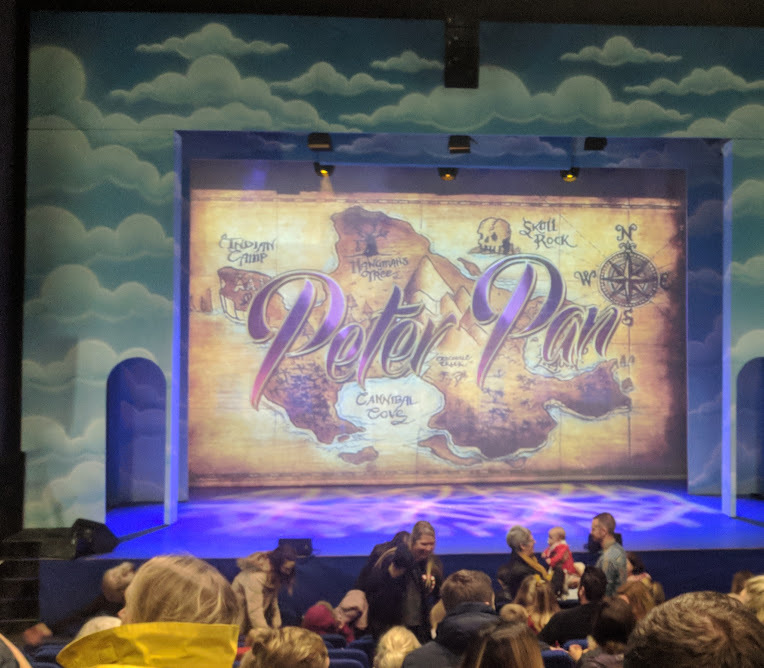 This year sees lots of special effects and I loved watching Peter and Wendy flying across the London Skyline and Tinkerbell whizzing around the stage. The visuals were really very good. The Lost Boys (played by SA Performing Arts Centre and Inspire Stage School) were fantastic and they thoroughly deserved all of the stage time they were given. They added a real modern bit of sass to the stage. The audience all clearly loved Costa as Captain Hook and he was at the receiving end of lots of audience boos. In keeping with tradition, there was a Blue medley at the end too and the whole production ended on a real high. Dancing along to One Love with your mam friends is always going to be good fun and yes, I remembered the moves much to H, H and J's embarrassment. This panto really is for kids, there were hardly any jokes which were just for grown-ups and although Jack and Heidi were killing themselves laughing in parts (especially at Ben Hansen from Tracey Beaker who played burger-loving Sparkey), unfortunately, there were no belly laughs from Harry, Steve or I. I think this panto is really lacking a 'messy' scene and I'd love to see one added next year which I think will bring the enjoyment factor for the whole family up a level. Unfortunately, this year's panto was really lacking strong vocals for me but thankfully this was made up for with plenty of one-liners, beautiful staging and lots of dancing. Steve Walls handles the crowd superbly and with ease and I reckon is the reason so many people return year after year. His banter with the kids and local knowledge/inclusion in-jokes is always spot on. I love the fact that Steve always makes the effort to meet the audience in the foyer after the show for photos too - I don't know anyone else who is this dedicated and the queues for a photo prove just how popular he is. This was the third panto I've watched this year and I've noticed this year's trend is to include songs from The Greatest Showman and renditions of Baby Shark - these don't escape the Playhouse and both received a great reaction from the audience. It's always a good night at the Playhouse Panto and I'd especially recommend a trip with younger kids (probably aged 4-9 is best). This show will not fail to have them screaming, jumping up and down in their seats and dancing along. It's also a good one to go along to with your mam friends and organise a group booking as you know the kids will have a good night and the Blue megamix at the end will remind you of your youth and give you a chance to embarrass the kids. The drinks at the Playhouse are also pretty cheap and you can take alcohol into the auditorium in a plastic glass (4 x cokes and 1 x juice was £6.40). There's also plenty of leg room in the seats and you're never squished into a seat here. 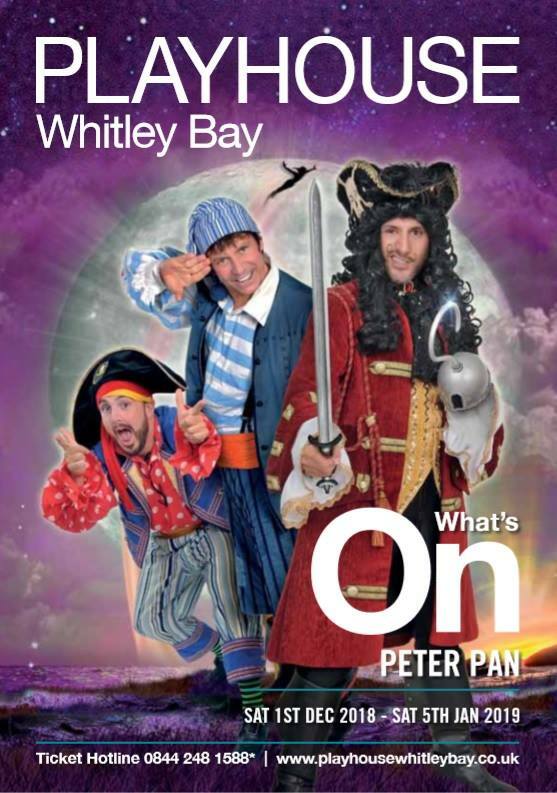 I probably wouldn't recommend this panto as the best in the North East for grown-ups only as there are others which are a lot funnier for the older generation but as a first panto or as a place to take under 10s, it's perfect. You can find out more and book tickets online here.